Whether you like or dislike Yes, there are a few things that are undeniable. 1) they are great musicians and 2) they are innovative. My short attention span doesn't always enable me to appreciate prog rock bands like Yes as much as others, but I know talent when I see it. I would say I am a casual fan of Yes. I know a few of their singles (I See All Good People, Owner of a Lonely Heart, Roundabout) and I know Rick Wakeman from some of his other projects (David Bowie's Hunky Dory album and the soundtrack to the 80s slasher film The Burning) as well as Steve Howe playing on Lou Reed's first solo album and being The Replacement's Bob Stinson's guitar hero. Ok, so those are pretty loose ties to the band, but it makes me more interested in learning about them. 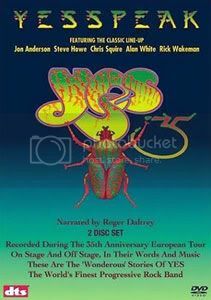 Yesspeak is a 3 hour documentary/concert film released by MVD that focuses on the band's 35th anniversary tour with their classic lineup of Jon Anderson (vocals), Steve Howe (guitar), Chris Squire (bass), Rick Wakeman (keyboards) and Alan White (drums). We are shown lots of behind the scenes footage of the band talking from their homes about the tour as well as backstage views of the band members warming up and traveling. There is also lots of great concert footage mixed in to entice fans. Yesspeak is a dream come true for Yes fans and anyone who likes rock documentaries. The mix of music and interviews is perfect and the band members all have interesting stories to tell about the past, present and future of Yes. The one aspect of the film that might put off casual fans is the long running time. For Yes fans though, this just makes it that much better. I did find myself fast forwarding through a couple interviews that dragged but for the most part they were quite interesting and informative. The fact that this film made me want to hear more of Yes's music proves that it was well worth the watch and I highly recommend it to music fans of all genres.